We had no idea how big this would be. About 700 submissions in just a few months. We read every story, loving some, setting them aside, arguing among ourselves, wishing we could publish more, and finally, agonizingly, whittling it down to 30. We peppered the mix with some original work of our own as well, hired a ton of our friends and folks we admired from the world of comics and webcomics to illustrate the book, and we had a manuscript all set to shop to publishers. During that time between when we opened submissions in 2007 and now, a funny thing happened. We learned a lot about how publishing works, but the most important thing we learned was that big trade publishing is like a train. Big trade publishing runs on tracks. Big trade publishing can’t turn on a dime; big trade publishing desperately needs all the coal it can find to run — meaning licensing rights. Audio rights. Electronic rights. Foreign rights and movie rights. They sell all those rights separately and hopefully make enough money from it all to pay the rent on the New York office and the salary of all the staffers in that office. We didn’t want to sell ebook rights; we wanted to release the ebook for free as a PDF. We didn’t want to sell audio rights; we wanted to record the audiobook ourselves, and release it for free as a podcast. Movie rights remain with the authors — if you love one of the stories in this book and want to make a blockbuster film from it, contact the author and give them the money. We’re not in the middle. And we live on the internet enough that we knew we could sell this book. This isn’t some vanity-press sour-grapes effort. The simple truth is that we probably can’t compete on the shelves at Barnes & Noble alongside every other book in the world. The agents and the publishers are right; it might not work for a mass market. That’s okay. We don’t need to sell it to everyone. We don’t need to sell 100,000 copies; we don’t have the rent on a New York office to pay for. We only need to sell it to you. On October 26, we want to send a message that a little project dragged kicking and screaming from “crazy idea” past “it’ll never work” all the way to “By God, they actually did it” can make a big splash. We’re internet people; you are too. We want to prove to all the people who said “this will never sell” that internet people make things happen. Did you know that on any given day, an Amazon.com bestseller only sells a few hundred copies? Sure, they sell a few hundred copies a day for weeks and months on end, but what we’ve learned is that it only takes a few hundred sales on a single day to become an Amazon.com bestseller. 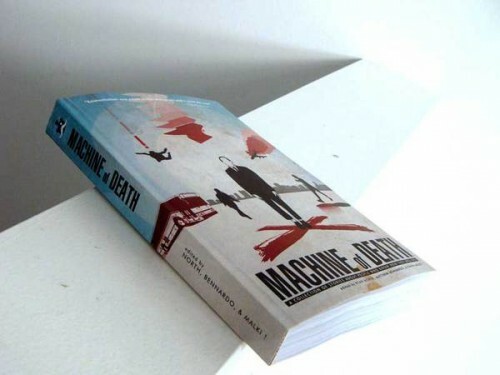 We want Machine of Death to become a Number One bestseller for exactly one day — October 26. Now, if you are morally opposed to patronizing Amazon for any reason, that’s totally fine. The book will be available online in our own e-store in early November, and (hopefully) through regular bookstore distribution sometime after that. If you’re international and can’t patronize Amazon.com, you can watch for it in our own store later and help us spread the word in the meantime. Individual contributors may be retailing it themselves through various means as well, at their discretion. The ebook and audiobook are coming soon, and both of those will be free. But if you can help us become a bestseller for a day, October 26 is that day. Here are some link banners you can use if you like — point them to this post, or to the Amazon link, or to your own affiliate-laden Amazon link, or to your elaborate MOD fanfic, or whatever. Blog, tweet, or join our Facebook event and invite your friends. Every bit of promotion helps. Let’s see if we can do this. More posts throughout the week with more details! P.S. Camron Miller or William Grallo, if you see this, please email us: info [at] machineofdeath.net. Thanks!